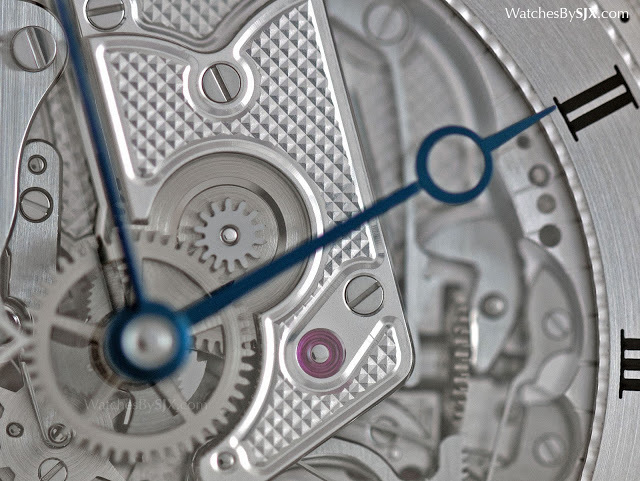 A classical minute repeater with a clear sapphire dial, the Classique Skeleton Minute Repeater Ref. 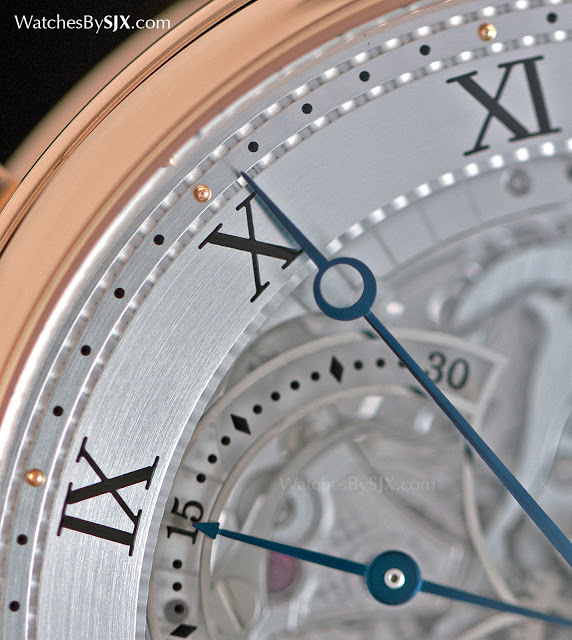 7637/1 is elaborately decorated and typically Breguet in style. Pomme hands, guilloche dial and a fluted case band are the key ingredients for the quintessential Breguet aesthetic, one inspired by the brand’s historical pocket watches. 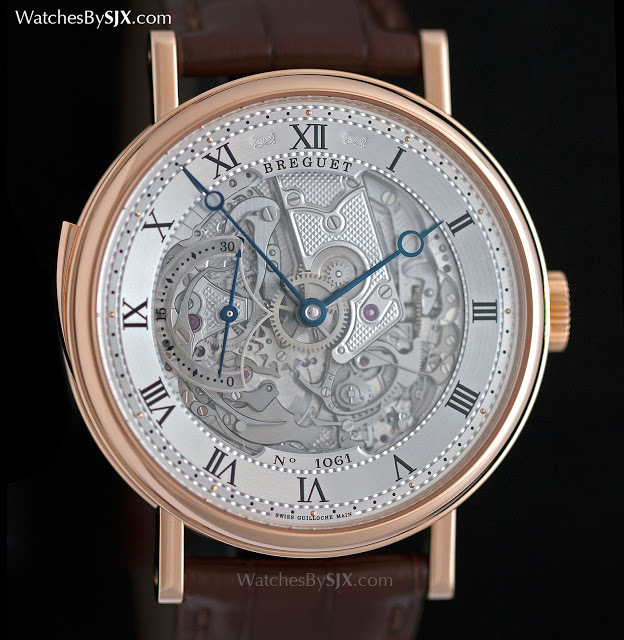 The Classique Skeleton Minute Repeater Ref. 7637/1 adds a twist to the distinctive Breguet aesthetic, in the place of the guilloche dial it has a clear sapphire disc that reveals the racks and snails of the minute repeater mechanism. Though the sapphire dial is a contemporary look, the watch is still nonetheless reassuringly old school, both mechanically and aesthetically. The repeater mechanism is entirely visible through the sapphire dial, a feature found only on the boutique-exclusive version of this watch (the regular edition has a traditional guilloche dial). 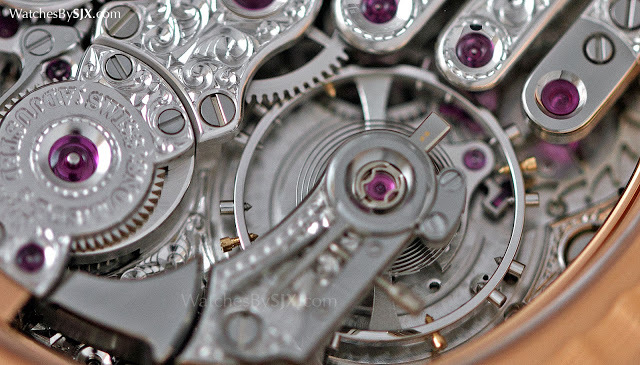 Most of the movement base plate has been removed, but what remains has been finished with a hobnail guilloche. 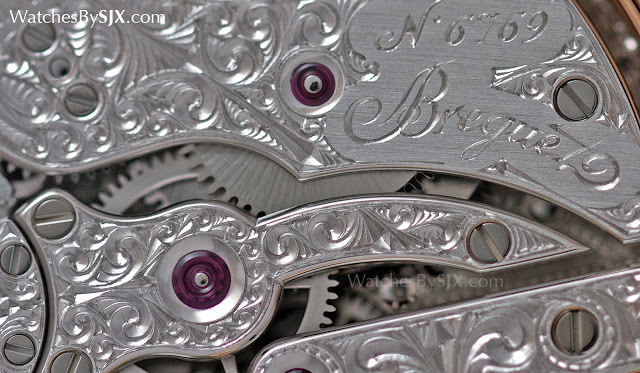 There’s little contrast in colour amongst all the components visible, with the silvery rhodium finish of the bridges contrasting little with the steel levers and gears. This means the depth of the dial is lost until examined up close. 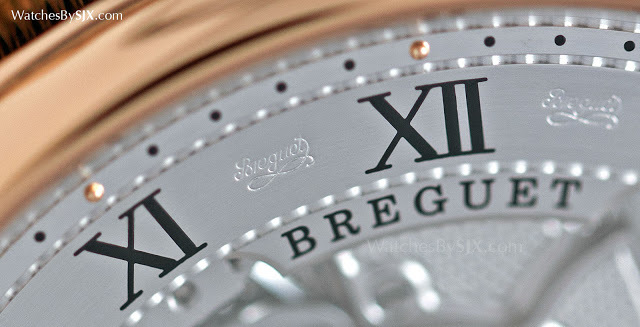 Like all other Breguet watches the dial (more of a chapter ring with hour numerals in this case) is made from silver-plated solid gold, with hand-applied guilloche. 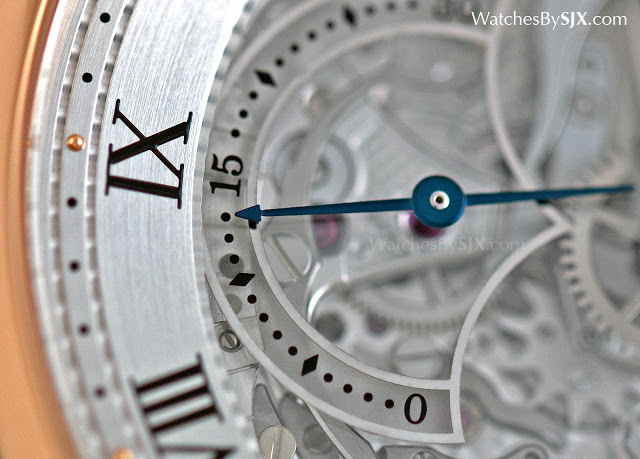 The dial is high quality obviously expensively made as are the fine, blued steel hands. 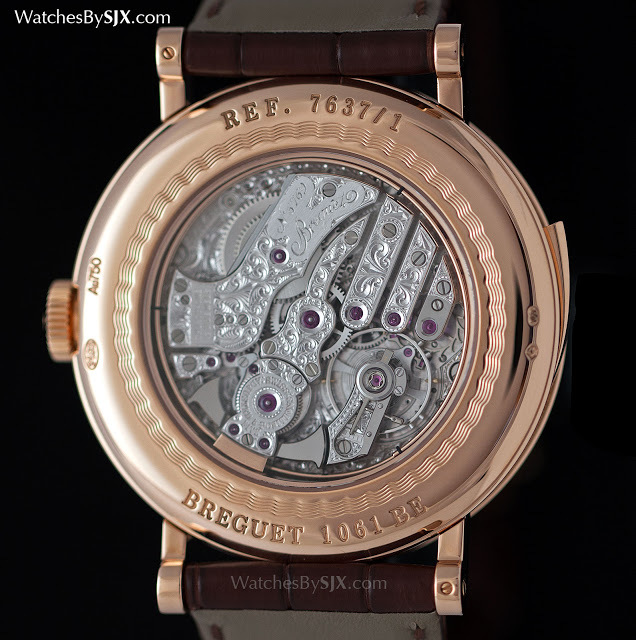 The movement inside is the Breguet calibre 567/2, originally the Lemania calibre 399. 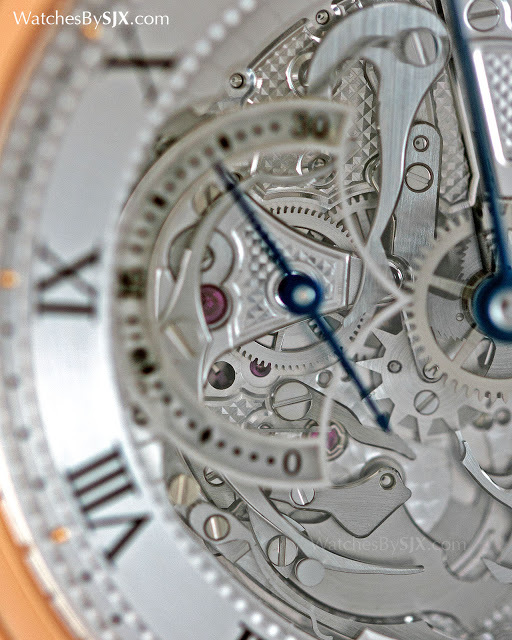 A long established movement maker that was formerly known as Nouvelle Lemania but merged into Breguet, Lemania was once the de facto supplier of complicated movements to high-end brands, providing movements to Patek Philippe and Vacheron Constantin until about a decade ago. 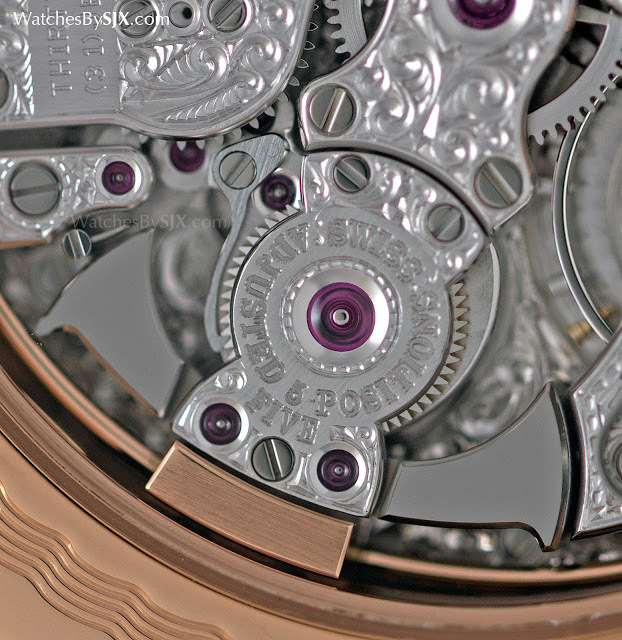 The Patek Philippe CH 27 movement for instance is based on the Lemania calibre 2310. Like many other Lemania movements the calibre 567/2 found in this repeater is styled like a vintage movement, with the layout and construction typical of a minute repeater pocket watch. It is charmingly old fashioned, lacking the inventiveness of the new Breguet Tradition repeater, but the look is pleasingly classical. But it is not outdated, having been improved significantly. 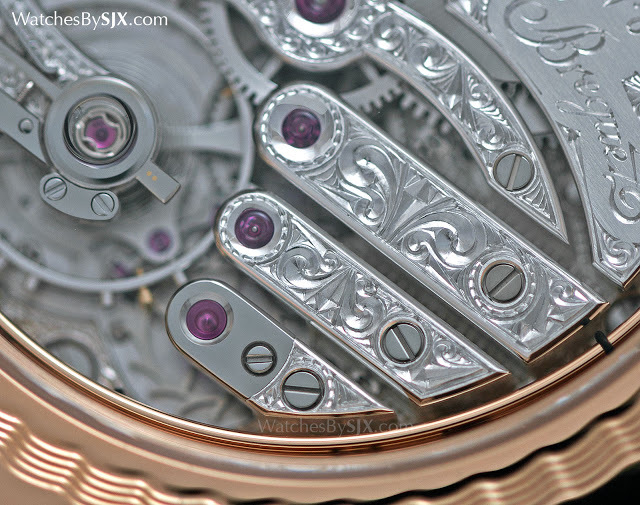 Most visibly the gongs are made of solid rose gold, matching the colour of the case. The new gongs and hammers translate into loud chimes. And the sound of regulator has been reduced. This means the repeater is admirably clear and audible. 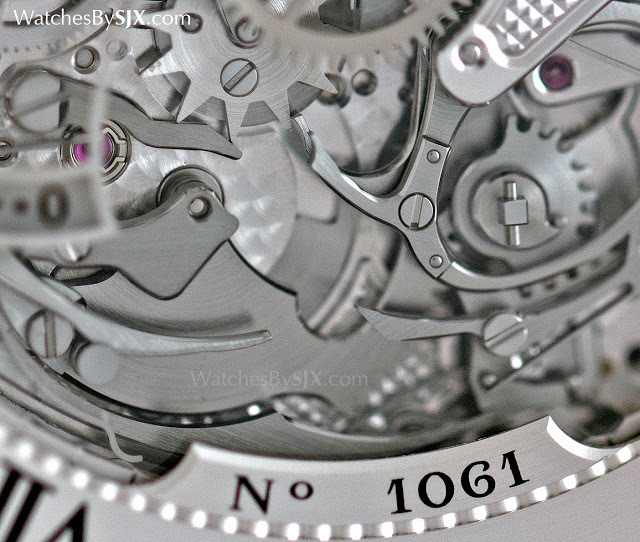 Besides the gongs, the rest of the movement is almost monochromatic just like the dial. 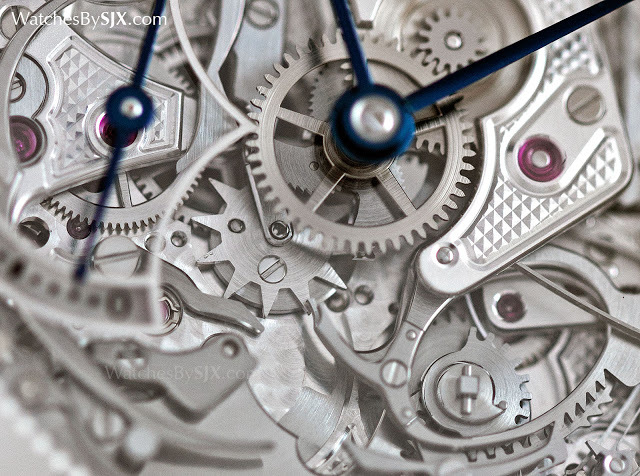 Rhodium plating is used for nearly all the components, even the gears. This provides a strong contrast with the rose gold case, however, some of the detail of the movement gets lost in the single tone finish. The elaborate, hand-engraved floral motif on the bridges, for instance, is best appreciated up close. 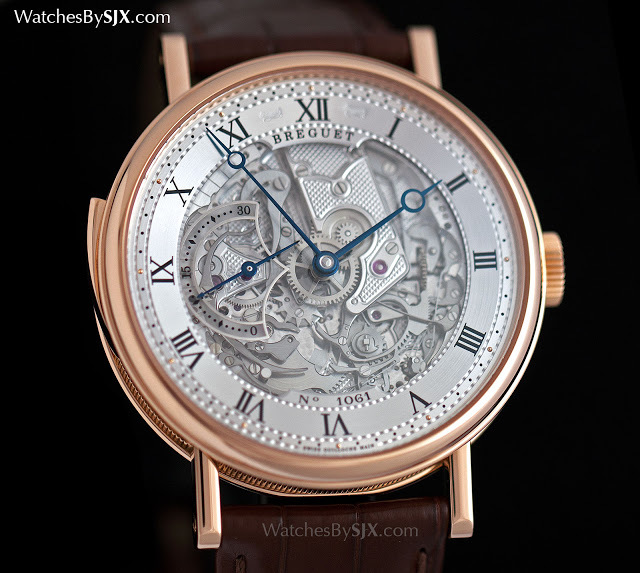 The Classique Skeleton Minute Repeater Ref. 7637/1 is priced at S$339,600 (equivalent to US$247,000) including seven percent tax and is available only at Breguet boutiques.